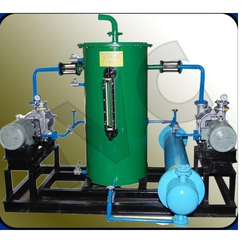 Manufacturer of a wide range of products which include closed loop liquid ring vacuum pump system. We are well-known for exporting and supplying best in class Closed Loop Liquid Ring Vacuum Pump System (Full Recovery). Our offered systems are widely accepted in the market for their excellent functionality and superior design attributes. Owing to their procurement being done from trusted vendors, these systems possess high suction efficiency for long duration of time with maintenance free aspects. Furthermore, we supply these systems to customers in tamper-proof packaging at competitive market rates. Looking for Closed Loop Fully Recovery Liquid Ring Vacuum Pump System ?